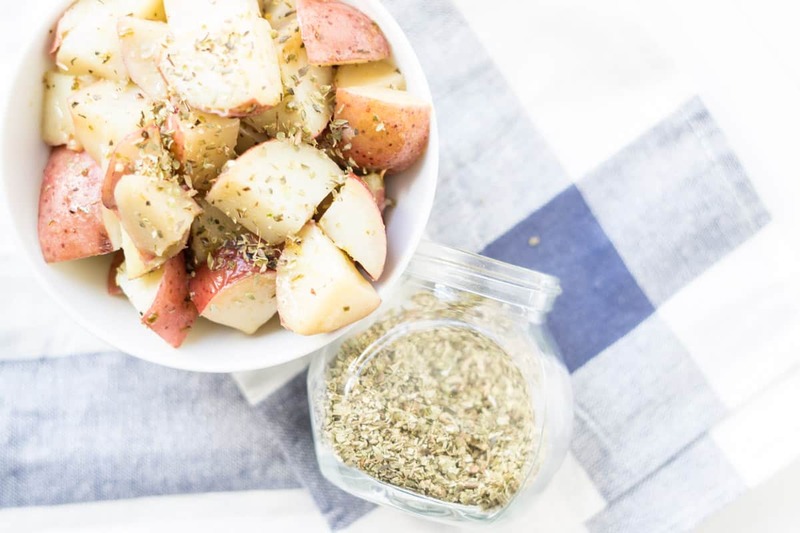 Healthy, quick, and easy! 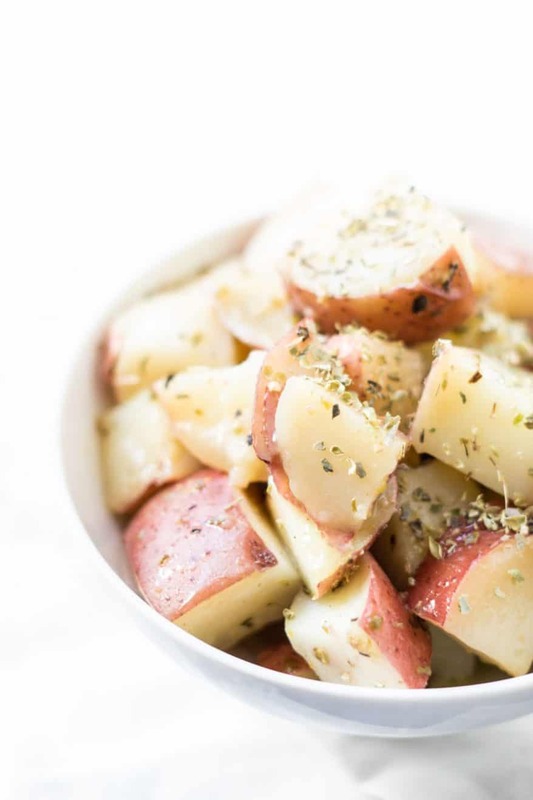 These Instantpot Greek Lemon Potatoes are potato perfection! Pair with chicken souvlaki skewers and a Greek salad for a tasty meal. I’ve taken a few shots at this recipe, and you’ll be glad that I persisted, because I can honestly say now that it’s perfect! You won’t find tastier Greek Lemon Potatoes anywhere, I guarantee it! If you happen to have leftovers of these InstantPot Greek Lemon Potatoes, you are one lucky person. First of all, because that means you get to enjoy them twice. Secondly, they work really well to re-purpose them! You can fry them up on the stove and have the tastiest hashbrowns to add to scrambled eggs for breakfast. If you haven’t perfected scrambled eggs yet, don’t worry, I’ve also done extensive recipe testing on scrambled eggs and have come up with the perfect way to make them. I’ve also used them in this sheet pan pork and prunes meal, which made the whole thing off the hook! Notice those gorgeous red skins on the potatoes? That’s where the magic of potatoes lies! Every recipe for Greek lemon potatoes that I’ve seen calls for peeled potatoes. Sacrilege! Peeled potatoes drive me crazy, because the skins have considerably more fibre than the flesh! Don’t throw out the good stuff! Fibre is a key nutrient for keeping both our guts and our hearts healthy. We need fibre, not only to keep things moving in the gut, but also to promote the growth of healthy gut bacteria. Essentially fibre is the food that the good bacteria live off of! Not only that…. it’s SO MUCH WORK to peel potatoes! So go ahead: be lazy and keep the peels on your potatoes! Want more InstantPot recipes? Check out my Thai Peanut Chicken, Korean Beef, Thai Yellow Curried Chickpeas and Potatoes, or Moroccan Beef and Lentils! Cut into bite-sized chunks and place in Instantpot. Whisk together the olive oil, lemon juice, oregano, salt, and bouillon. Crack some freshly ground pepper over top. Press manual and choose 7 minutes. Use release method of your choice. *I like to use the Better Than Bouillon paste. It has a delicious authentic chicken broth flavour! Made this recipe yesterday – and it kept burning onto the bottom and so the pot wouldn’t come to pressure. I didn’t notice it the first time through, so the potatoes ended up cooking through, even without achieving pressure. They did taste good, but wondering if there’s a way to prevent it cooking onto the bottom! I’m so sorry they burned for you! Did you stir everything together before closing the lid? You could also add more lemon juice and oil. When I first started recipe testing, I used more lemon juice and oil but then it ended up soupy. So I kept lowering the liquid until I found the sweet spot. Maybe your potatoes were a drier variety than I’ve been using? I did stir it all together, but there was still a covering of liquid on the bottom, which is what burned. I’ll play around with the ratio! Can I double/triple this recipe? I can’t find it but I know that Melanie commented on one post about how she made them in the oven! I think you would need more liquid. When I first started testing this recipe I had a lot more liquid but since the pressure cooker keeps it all in I kept decreasing the amount until it was just right. It’s really too bad when new vegans don’t understand the need to go SOS free so we can all be as healthy as possible. I understand the need for new vegans to being able to let go of unhealthy thing a little at a time but at some point you would think more long term vegans would want to be as healthy as possibe. 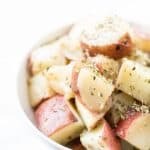 Love lemon potatoes……….my concern is you are only using 1/4 of liquid (lemon juice) and whatever the bouillon paste melts down to for the entire recipe. Are we missing additional liquids , won’t it burn? BTW: happy to have found your site and the assortment of recipes. I have made this recipe dozens of times now. I started off with much more liquid and slowly used less and less each time until I found the “sweet spot.” I’ve read reviews on other Instant Pot recipes of people reporting burning while the author hasn’t. I wonder if it makes a different in which model is used? p.s. it also tastes really good if you had some water. This is what I started with initially. I just didn’t like how “soupy” it became! Just made this recipe tonight with some BBQ pork chops and it turned out great. Very tasty. Followed the recipe exactly as shown and my instant pot built up the pressure and cooked the potatoes great there was even a little bit of juice in the bottom of the pot it is definitely a repeat recipe. Awesome! Thanks for the feedback. Can I ask which model of Instant Pot you have? I myself use potatoes along with their skin.I tried this and this was amazing. Delicious! My wife and I just bought a 6 quart Instant Pot DUO. I made these last night along with chicken skewers and a Greek veggie salad. We both thought they were the best I’ve ever made! I have to admit I added a quarter cup of water, because I was nervous about the liquid running out. But it looks like I didn’t have to. Thanks for helping this newbie start to build an awesome recipe repertoire for the Instant Pot. Yay! I appreciate you taking the time to let me know how the recipe went for you! These were better as leftovers even. Toasted in the oven for hashbrowns, delicious! Yes! these make the best hashbrowns! This recipe is a staple in our house now. Admittedly, I didn’t have oregano the first time so I used thyme instead and we loved it. So I don’t know how the oregano tastes. But this is an awesome recipe. (I used the veg boullion you recommended) I’ve never had an issue with burning and have made it 20+ times. Sweet! Thanks for the comment! 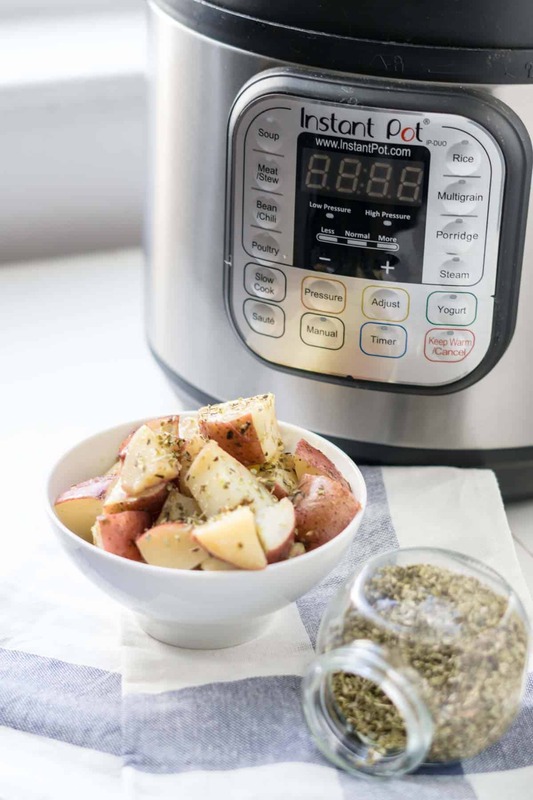 I’m wondering if there’s a difference with the burning between different types of instant pots? Which one do you have? I have the 6 qt. IP-DUO. I would think the larger pot would be more prone to burn since there is more heated surface area. Is there a larger size than 6 qt? I also used small red skin-on potatoes. Once again, LOVE these potatoes. Ooo, good point! That’s the one I have too. I should update the recipe to state that it’s been tested on the IP-DUO 6 qt. The recipe is very good! The potatoes are gummier than if I roasted them in the oven (I was also using russet potatoes which might contribute to that) but this is so much faster. I did broil the potatoes after and squeezed more lemon juice on, but the base recipe is fine. I did not get any burning at all. Yes, we love to broil the leftovers to make hashbrowns!